There’s news of a large coronal hole on the Sun, which just goes to show how good astronomers are at making the mundane sound terrifying. In turns out coronal holes are neither dangerous nor uncommon, but what exactly are they? The corona is an outer region of diffuse plasma surrounding the Sun. At a basic level, the Sun can be grouped into three parts: the interior, the photosphere, and the corona. If you you think of the photosphere as the surface of the Sun, then you can think of the corona as the Sun’s upper atmosphere. It was first discovered due to its halo or “crown” effect during a total solar eclipse, hence it’s name. When we finally had space-based x-ray telescopes in the 1970s it was noticed that there were sometimes dark regions in the corona, similar to the way sunspots appear in the photosphere. These “holes” in the corona seemed to be caused by a lack of hot ionized material in the region. We now know that these coronal holes are due to an interaction between the charged plasma of the corona and the Sun’s magnetic field. 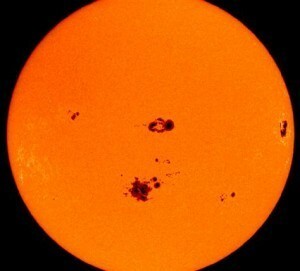 Typically the solar magnetic field loops back on itself near the Sun’s surface. The plasma tends to follow along magnetic field lines, so the material of the corona tend to stay trapped near the Sun’s surface. But sometimes the magnetic field tends to weaken in some areas, and the field lines tend to be directed away from the Sun. 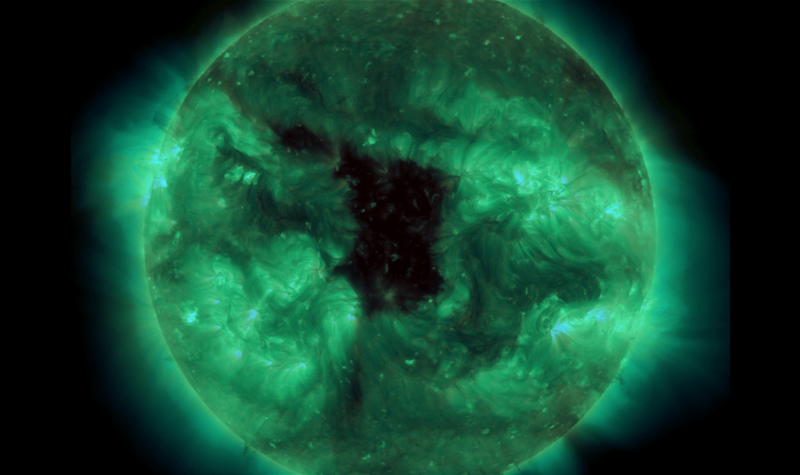 When that happens the material of the corona is pushed outward by solar wind, creating a coronal hole. Like sunspots, coronal holes tend to follow an 11 year cycle. If a coronal hole happens to face Earth we generally get more aurora, but that’s about it. So the appearance of a large coronal hole on the Sun is somewhat interesting for astronomers, but it’s nothing we haven’t seen before. Is is just me or does anyone else think geomagnetism holds the answer to our energy future? Not me. 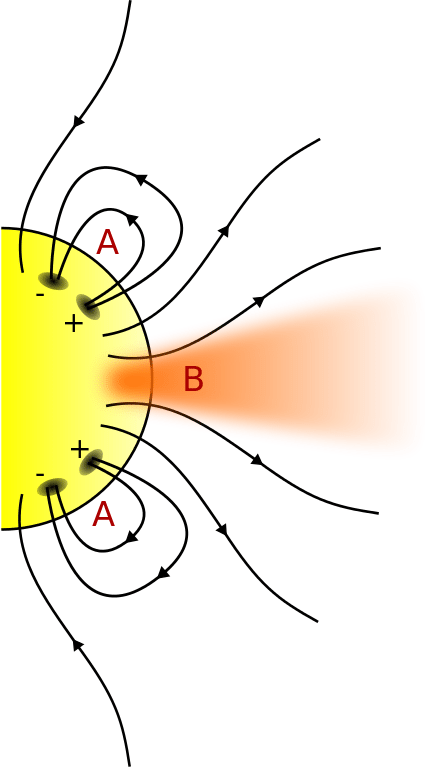 How do you think geomagnetism could substitute for current energy sources?